This tutorial will teach you a few quick and easy ways to find out how many days are between two dates in Excel. Are you wondering how many days between two dates? Maybe, you need to know the number of days between today and some date in the past or future? Or, you just want to count working days between two dates? Whatever your problem is, one of the below examples will certainly provide a solution. 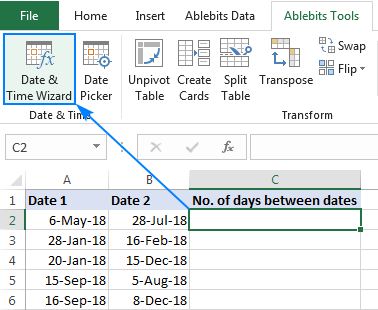 Below you will find the detailed explanation on how this formula works and learn a few other methods to calculate days between dates in Excel. Where A2 is an earlier date, and B2 is a later date. As you probably know, Microsoft Excel stores dates as serial numbers starting on 1-Jan-1900, which is represented by the number 1. In this system, 2-Jan-1900 is stored as the number 2, 3-Jan-1900 as 3, and so on. So, when subtracting one date from another, you actually subtract the integers representing those dates. In our example, the formula in C3, subtracts 43226 (the numeric value of 6-May-18) from 43309 (the numeric value of 28-Jul-18) and returns a result of 83 days. The beauty of this method is that it works perfectly in all cases, no matter which date is older and which is newer. 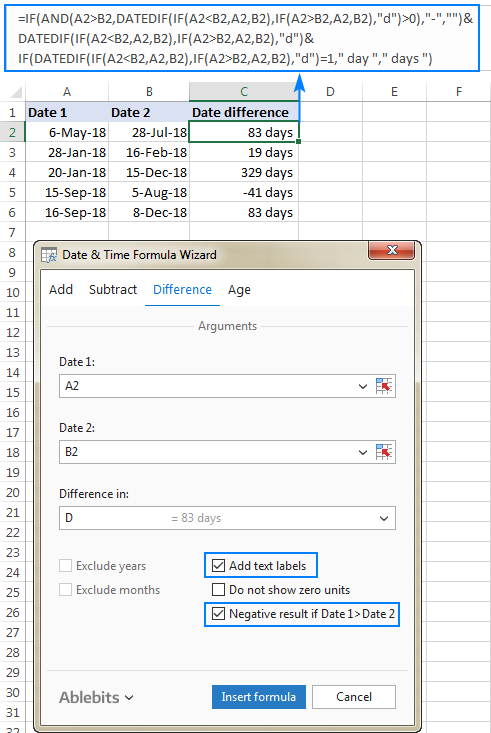 If you are subtracting a later date from an earlier date, like in row 5 in the screenshot above, the formula returns a difference as a negative number. 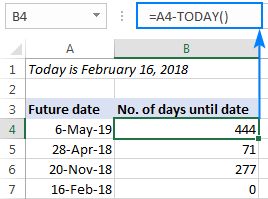 Another way to count days between dates in Excel is by using the DATEDIF function, which is specially designed to work out the date difference in various units, including days, months and years. Note. DATEDIF is an undocumented function, meaning it is not present in the list of functions in Excel. To build a DATEDIF formula in your worksheet, you will have to type all the arguments manually. 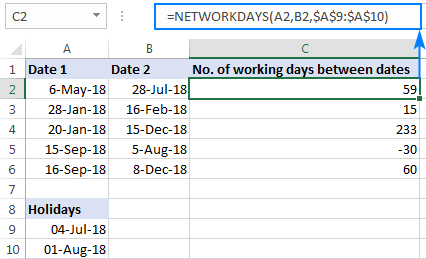 The users of Excel 2013 and Excel 2016 have one more amazingly simple way to calculate days between two dates - the DAYS function. In fact, calculating the number of days from or before a certain date is a particular case of "how many days between dates" math. For this, you can use any of the formulas discussed above and supply the TODAY function instead of one of the dates. The first two arguments should already look familiar to you, and the third (optional) argument allows excluding a custom list of holidays from the day count. Tip. In case you need to handle custom weekends (e.g. weekends are Sunday and Monday or Sunday only), use the NETWORKDAYS.INTL function, which allows you to specify what days of the week should be considered weekends. In the Date 1 box, enter the first date (start date) or a reference to the cell containing it. In the Date 2 box, enter the second date (end date). In the Difference in box, select D.
The wizard immediately shows a formula preview in the cell and the result in the Difference in box. Click the Insert formula button and have the formula inserted in the selected cell. Done! Show text labels - the word "days" will appear along with the number, like shown in the screenshot below. Do not show zero units­ - if the date difference is 0 days, an empty string (blank cell) will be returned. Negative result if Date 1 > Date 2 - the formula will return a negative number is the start date is later than the end date. To have a closer look at the formulas discussed in this tutorial, you are welcome to download our sample workbook to How Many Days Between Dates. 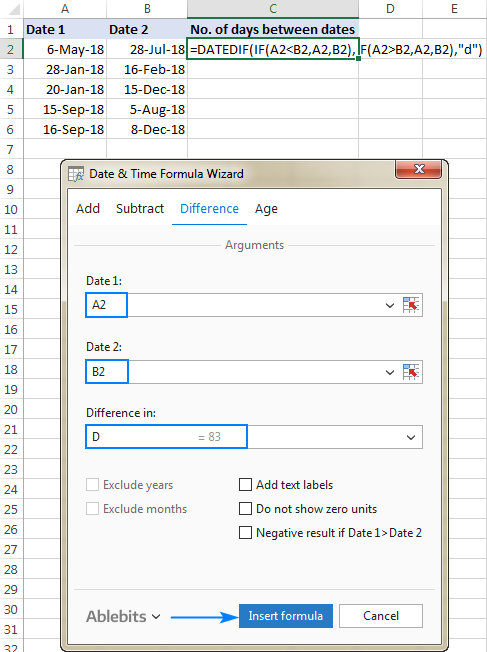 24 Responses to "How to calculate days between dates in Excel"
how to calculate times difference. if start date and start time in different column and end date and end time are in different column than how to calculate. Format each cell the way you usually do for each variable. Format the result cell as General or Number. Very informative and useful for me. In testing, it appears the DATEDIF does not compute date values prior to Jan 1, 1900. What's the solution for computing date different (age, for example), if the birth date is in the late 1800s? According to Microsoft there is a VBA Macro you can use. You can also learn about Excel date functions in Excel in this article on our blog. for Example 23/10/2018 what would be the Day? Thank you for contacting us and for your question. You can learn more about date formats in Excel in this article on our blog. I am trying to total the number of days a certain job takes to do. 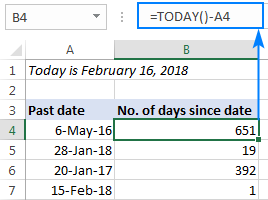 However if the task is done in the same day how do I get excel to count this as 1 day? Just enter this formula in C1 and then copy it along the column. I'm trying to do something similar to Danielle, but would like to calculate the number of days something is open, so I would need to use 3 dates to calculate this, date open, date closed and today. Would anyone be able to help with the formula? Please share demo how to do like this because i trying so many time but i not get actual formula so i request to you share on video to how make formula this is very valuable formula. I have entered entry and leaving dates from India for last 3 years, and have found the number of days in between. I want this for a range of dates, example in 2017, how many days was I in the country? Pls help, thanks. I need a formula to calculate number of days between 2 dates. However, the number of days must be separated. Example: column A: 29/1/19 - 2/2/19, then column B = number of days for January, column C = number of day for February. Hi...is there a way to Calculate the # of workdays between 2 dates & then allocate them by month? I just can't seem to get any formula to work? START DATE 12/18 DAY OF MONTH* 18 END DATE 1/4 DURATION*(WORK DAYS) 14 DAYS COMPLETE* 14 DAYS REMAINING*-56	TEAM MEMBER ABC PERCENT COMPLETE ? Count days from today. If the call is blank, shows nothing. Hi, I need help if someone knows about excel formulas. I have an excel sheet that has an ordered date and days been ordered. But some of the cells do not have requested date, in that case, I need the cells to be empty. I want formula for counting days between two dates. In case of from date and to date are same so here the number of days is 1. But all above formula shows 0.